Camp Northern Lights started in its present location in the Haliburton area in 1972. The government was petitioned for a land use permit and out of three locations offered to the Board of Directors, the site on Lochlin Lake was selected. In the spring of 1972 the Knights of Columbus erected the main cabin. It was 24’ by 48’ and had a kitchen, pantry and a dining room area. After the campfire each night the counsellors held their meetings in the dining room. There were 6 weeks of camp (4 for boys and 2 for girls) aged 9-14 from the Peterborough area. Counsellors were volunteers from 6 youth groups with each group counselling one week. Everyone slept in tents. The camp director ran the camp, drove the bus and looked after the horses. There was also 4 other paid staff positions: 2 cooks, a lifeguard and an arts and crafts director. There was no hydro or phone. A generator provided the power for the fridges and freezer. The stove and 2 lights ran on propane and there was a Coleman lantern for the counsellor’s meeting at night. Northern Lights maintained the same program from 1972-1983. For a variety of reasons the Camp did not open during 1984 and 1985. A few groups did go up and use the facility such as Youth of Otonabee. In 1985 a concerned group met in attempt to re-open Camp Northern Lights. During the winter of 85’-86’ a Board of Directors was assembled, plans were made and the camp did open in 1986. There were now 6 weeks of camp, and this time is was 3 for boys and 3 for girls. The camp has been organized this way ever since! 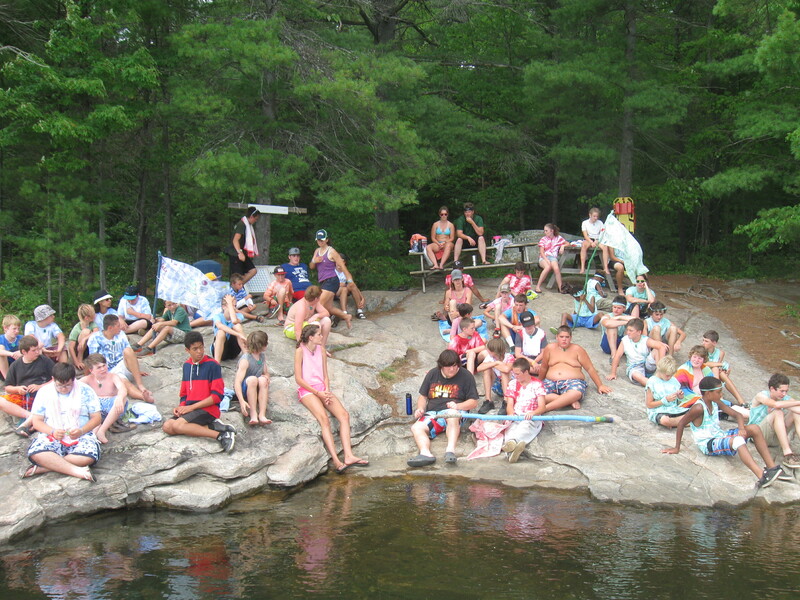 Campers and counsellors now come from Peterborough, Victoria, Northumberland and Clarington areas. Each fall a referral request for potential campers is sent to Big Brothers, Big Sisters, Social Family Services, Kinark, St. Vincent de Paul, and the local Catholic and Public Elementary Schools. The High Schools within the same locales received counsellor application forms. The camp recruits 12-16 volunteer counsellors for each week of camp. The staff consists of a Camp Director, 2 cooks, an arts and crafts director, minimum 3 lifeguards and a games director. to disadvantaged children aged 9-14 who otherwise may not have this opportunity. As well we are also providing a leadership experience for the secondary students as volunteer counsellors. Tag Days – There are usually 2 tag days each year. There is one in the Peterborough area and a second one at LCBO stores and other locations at sites in communities that we draw our campers and counsellors from. These tag days usually occur in April and May each year. Campers, counsellors and volunteers help run these events which typically raises approximately $25,000 – $30,000 between the two tag days. Church Collections – approximately 20-22 parishes in the catchment area have a Special collection for the camp. Roughly $20,000 – $25,000 is raised. Words cannot convey the gratitude that is felt by this generosity. Bingo – the camp has a dedicated group of bingo helpers that run bingo days and nights on a fairly regular basis. Approximately $20,000 is raised each year, and Camp Northern Lights is very appreciative of this support from Delta Bingo. The remainder of our funding comes from private donations. By working hard to raise these funds we only ask potential campers to pay $20 for the week if they can afford it. Camp Northern Lights is governed by a volunteer Board of Directors who work together to make decisions and provide overall guidance in support of the Camp's mission and values. The Board of Directors is comprised of a diverse group of individuals with a variety of skill sets. This dedicated team works in both an advisory role and hands-on approach to allow the camp to operate from year to year.